Their journey was difficult and not for fun but it was interesting! A Journey in the mind only but a fun one. Science Fiction/Fantasy series "Elanclose" book one video ad. What I like about Winnipeg is how easy it is to access downtown. It has one of the best road systems I've ever used. Luckily our hotel was located on one of the many that slid into the centre and back out again with as little disruption as possible. Yeah! Not having to sit in blocked or slow traffic for what seems like eons is a big plus for this city. Walking through downtown Winnipeg is pleasant, it has the beautiful Memorial Provincial Park and fountains in front of the impressive Manitoba provincial legislature building (seen above). There's other interesting architecture including the law courts, but my main point of interest is Winnipeg Art Gallery or the WAG as it likes to refer to itself. The WAG is a wonderful gallery with multiple floors to casually walk through including a rooftop of fabulous sculptures made of various metals and interesting concepts. I've attached a photograph from inside one of them. My main interest was the 100 Masters Exhibit and I wasn't disappointed. 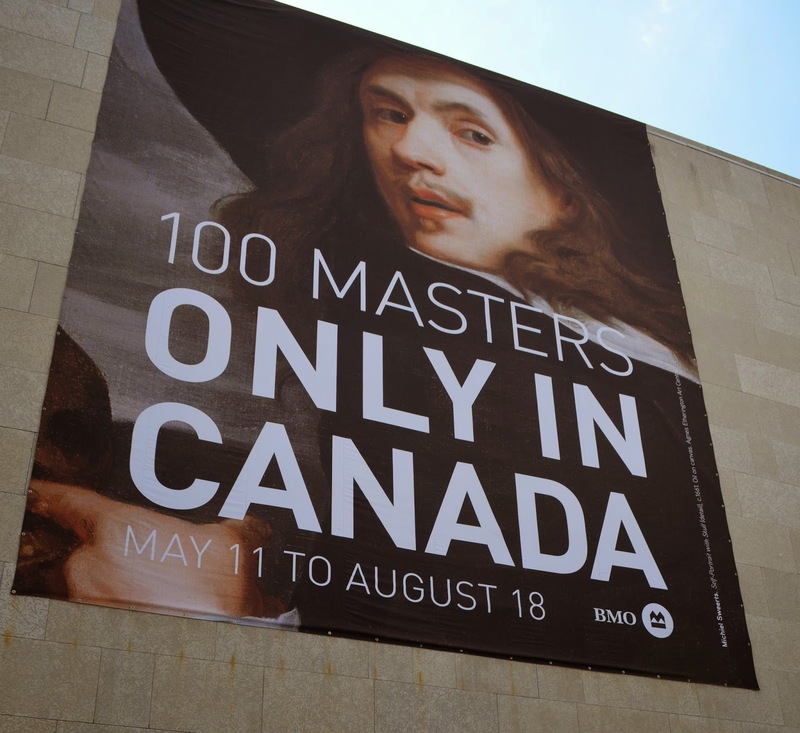 The 100 Masters Exhibit is a collection of work from some of the best artists the world knows. Pieces from each painter are brought together for you to view and compare their exemplary work. The difference in design, material, brush strokes, paint and technique are segued into the best display I have ever seen. The display is awe inspiring from start to finish and fascinating by the information on each piece. I have no idea how long I spent in these climate controlled rooms as every painting is mesmerizing. The thought of the time and ability it took to make them is amazing. I am still astounded by the brilliance of the masters and they are truly that - the masters. Outside of these rooms is an area to view the masters artwork on a touch screen table. With the ability to zoom in on sections you can see even more of the detail that went into these paintings. I have attached a painting by Cornelius David Kriefghoff, the minutiae in this picture made me gasp when I stood in front of it. The WAG provides other sources of amusement for you in this area, gifts to purchase and for the child or those still holding onto that inner child, portraits to stand behind and have your picture taken. A step into the past that made me laugh when I saw the photograph. I don't think the prude look is very fetching for me, I asked by husband "does this dress makes me look fat?" Continuing with the humour, I've attached it so you can have a laugh out loud moment. I was shocked to learn that Renoir's painting "Le Concert" was done with the paintbrush strapped to his wrist because he was crippled with arthritis. It shows the extent of his talent to be able to create such beauty through so much pain and paralysis. The painting is shown below from the table I talked of earlier, Please excuse the angle the photograph was taken at, it is not my best but it still displays my point. Although the 100 Masters exhibit has gone, the WAG always has excellent exhibitions going on, at present it includes MAWA - Celebrating 30 Year of Women's Art, Lake Land Sky by Kirsten Britt Hansen and European Renaissance that has been on going since 2010 and finishes in 2016. There are several others too to hold your interest. The WAG is a definite list topper for those that love art or for those that appreciate talent and insightfulness. 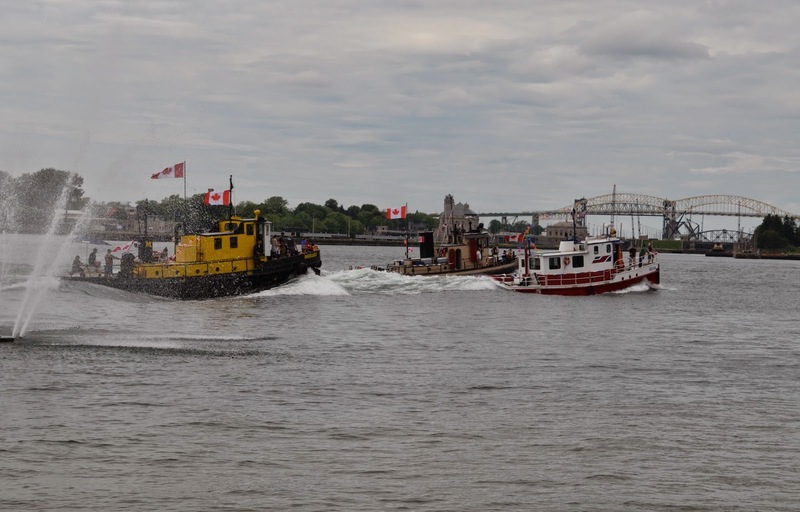 We arrived in Sault Ste Marie on the weekend of the tugboat races. They usually take place the end of June. One of the ships, the Nostalgia becomes a pancake breakfast restaurant and we saw hungry people clambering on board for a hearty meal. First, we decided to wander around the many boats that were tied to the docks and check them out. They were decked in flamboyant colours that were impressive in their creativity of decoration and brightened up an overcast day. When the races start it is hard to judge where is a good spot to watch. We ended up travelling down from the docks and finding a seat on the big rocks to watch some of the boats go by. Further down is better looking across at the United States power plant. You can't help but be awed by the Cloverland Electric Coopertative Hydroelectric Plant that faces you, it is massive and attractively designed for a functional building. Finally, we'd found our spot to get into the excitement of the tug boat races. Choosing a boat to cheer on we watched as they chugged past us. Our encouragement rang out along with the throng of supporters around us as we laughed at the small tugs that managed to out maneuver the big guys and left us thinking of our kids favourite t.v. show Theodore Tugboat. A wave of nostalgia hit for a moment as thoughts of our grown children's youth returned but were lost again as the next round of tugboats tossed upon the wakes of their competitors, and we all buoyed for our new tugboat to win. Fort St. Joseph's National Historic Site offers an interesting walk combining First Nation history with soldiers and natural habitat. It also gives you an extensive view of St. Mary's River. Sault Ste. Marie Canal National Historic Site has a building you can go through to learn more about the canal's history. You can also walk the canal to see the operating equipment for the locks. The canal is a gateway from the Atlantic Ocean to Lake Superior and by passes the rapids on St. Mary's River. The Norgoma Ship is a museum and sits within Sault Ste. Marie's docks for anyone to go on board. Relatively close by is the Art Gallery of Algoma which looks out onto the St. Mary's River. All of the above are within walking distance for those that don't mind a long stroll. Other places of interest are the Casino which is located in the heart of Sault. Ste. Marie and the Canadian Bushplane Heritage Centre. There are other attractions for you to see if your stay is a longer one. We were only there for a short time so our plan was to go on the Agawa Canyon Tour Ride. We'd heard that it was an amazing trip in the Fall and we hoped we would be just as happy with it in the Summer. We were. The tour is well done. The train is comfortable and equipped with video screens so you can see and hear the history of the areas you are travelling through. Points of interest are highlighted so you can take photographs and the beauty of the countryside is breathtaking. In the Agawa canyon the train stops to allow access to washrooms and picnic areas. There are several walks, one entailing many stairs for those with lots of energy and another that takes you to a few different areas of waterfalls that are exceedingly pretty. For those that have participated in strenuous walking the gentle rock of the train is wonderfully relaxing on the ride back. After seeing the canyons beauty in Summer I now have to go back in the Fall and see it in all of its colourful glory, I'm sure it is even more spectacular. Travelling is one of the best experiences in life. I've been to many countries and all of them have wonderful cultural information to offer the passing stranger. I feel lucky to have been involved in witnessing festivals, market gatherings, artistic expression and of course the beautiful vistas of nature. As a writer it was inevitable that I would, one day, put these experiences down, if not onto paper, then in a blog. I will mainly write about my present travels but since it's human nature to reflect on things that happened in the past I'll probably interweave some of them. Taking journeys can often entail tedium but splashes of excitement, humour and whimsy often abound. Fortunately, you get to miss the tedium and enjoy the rest. Join me as I talk about my journeys and I'll try to be one of the better tour guides out there. All photographs are copyright protected and the property of Krystyna Faroe www.elanclose.ca Photograph of Bon Echo Park, Ontario, Canada.